A recent decline in Chinese real-estate prices is starting to shake confidence in the country's economic vitality and open a debate about whether the country's economy is over-leveraged. That's what made the real-estate bubble's aftermath so painful for the U.S. and Japan. Just two months ago, China expert Nicholas Lardy dismissed concerns about what he labeled a "so-called property bubble" during a conference at the Peterson Institute for International Economics in Washington. Now, he says a housing downturn could produce a "major, major economic correction" in China, a view shared by other mainstream economists. What changed? A growing realization that much of China's massive stimulus spending and lending of 2009 and 2010 ended up in land purchases, driving up prices in an unsustainable fashion. And a recognition that the Chinese economic system routinely produces bubbles and is unlikely to change any time soon. The government keeps bank deposit rates well below the rate of inflation to benefit state-owned banks and other firms, which have the political power to defend the status quo. With few financial alternatives to beat inflation, Chinese savers buy real estate, even if supply soars ahead of demand. Between 2006 and 2010, investment in residential property jumped by half to about 9% of China's gross domestic product, according to Mr. Lardy. During that time, real-estate prices in major cities in China roughly doubled. During the next three to five years, says UBS economist Wang Tao, prices are bound to head sharply upward again because of the paucity of alternative investments for Chinese savers and the reliance of local governments on land sales for revenue. At some point, she figures, the boom could give way to a bust. Mr. Lardy expects the cycle to play out more quickly. Kynikos Associates short-seller James Chanos has been predicting for two years that a crash is imminent. No one knows for sure, of course. A number of events could trigger a big selloff, including a sharp rise in interest rates, the emergence of other investment options and higher taxes on property. Estimates of how badly the economy could be damaged by a real-estate slump reflect different views of the structure of the Chinese economy. The strength of the real-estate market directly affects the construction, steel, concrete, power and appliance industries. In all, about 50% of China's GDP is linked to the fate of its real-estate market, says Standard Chartered economist Stephen Green. While a downturn would batter the economy, Mr. Green said, it wouldn't be as devastating as the burst bubbles in the U.S. and Japan. In those cases, falling real-estate prices caused bad debt to mushroom, crippling the banking industry, too, and drying up credit. However, in China, far fewer consumers use debt to buy homes. There isn't a Chinese equivalent of the U.S. subprime mortgage. Other analysts say there are far more leveraged purchases of real estate than recognized in the official statistics. To fight the effects of the global downturn, Chinese state-owned banks, on government orders, lent about $3 trillion mostly to giant state-owned enterprises. The money was reported to have largely financed infrastructure projects, such as China's ambitious high-speed railway network. 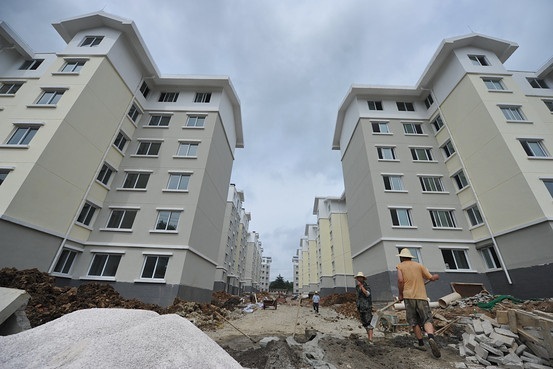 But many of the loans wound up financing real-estate purchases instead, said Deng Yongheng, director of the Institute of Real Estate Studies at the National University of Singapore. Prices at auctions for residential land in eight major cities doubled in 2009 largely because of highly leveraged purchases by state-owned companies, he and three co-authors calculate. In March 2010, state-owned companies bid up the price of one piece of Beijing land to 10 times the asking price, according to one analyst. The magnitude of the leveraged purchases is hard to gauge. One indication: Shortly after the Beijing land sale, the Chinese agency that oversees state-owned companies ordered 78 firms—whose charters had nothing to do with real estate—to cease buying and selling property. Nearly a year later, in February 2011, state-owned Xinhua news agency reported that just 14 firms had left the business and another 20 were expected to get out later in the year. A spokesman for the agency said that the firms needed time to finish their projects, but added that there isn't any prohibition against companies owned by provinces or municipalities to continue to invest in real estate. Over the past year, Beijing has put in place measures to temper real-estate sales, including raising the minimum down payment for mortgages on second homes to 60% and enacting China's first property tax. A number of economists forecast those steps will drive down prices about 10% by year-end. With demand drying up for apartments, real-estate developers are starting to invest in mines, reports state-run China Daily. But few expect the anti-bubble measures to last, given concern by the government and Communist Party about sustaining growth, which they see as a key to social stability. Late last week, an HSBC manufacturing activity index registered an 11-month low. The government's official purchasing manager's index, which usually lines up with the HSBC data, is due to be published Friday. Charlene Chu, a Fitch Ratings Service analyst in Beijing, who has documented how China's official statistics understate total lending, said state-owned firms have taken on heavy real-estate debt. Thus a sharp fall in prices would produce a raft of nonperforming loans and "would have an outsized impact on Chinese banks." In other words, a real-estate collapse could lead to a banking crisis—the kind of woes that have undermined the U.S. and Japan.